All attendees, speakers, sponsors and volunteers at our conference are required to agree with our Code of Conduct. This ensures that everyone has a great experience during the event. 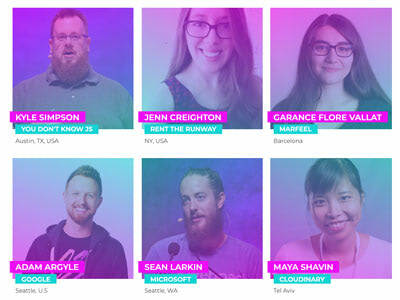 We are aware of the lack of diversity in the speaker line-up of tech conferences and we will do our best to select a wide variety of speakers representing people from all kinds of backgrounds. The proposals are completely anonymized during the initial selection phase to avoid any possible bias. All submissions are reviewed by the Program Committee. They vote on which ones should be selected. The top-voted submissions are de-anonymized to take speaker details into account, in order to ensure a diverse representation and to avoid things like having one speaker giving more than one talk. The most important thing is that you give a talk on something you are passionate or curious about! Frontend Frameworks: Preact, React, Vue.js, Angular, etc. Backend: NodeJS, Containers, Microservices, Serverless, etc. Testing, performance, optimization, tooling, etc. Mobile: Ionic, NativeScript, Cordova, Capacitor, etc. Talks that offer some insight into problems that you’ve faced and how they were solved, what approach was followed, and what lessons and new ideas were learned. Failure stories are also good learning experiences to share with the audience. Inspiring talks that motivate the audience to challenge themselves and try new ideas. The more thought you put into your proposal, the better the chances are that it will be selected! Make sure you show how much you care about the topics you intend to talk about. Follow the Code of Conduct. It’s imperative that your talk adheres to it. We value original ideas applicable to real-world problems. Be brief and try to go straight to the point. Review your proposal before submitting it. Be careful about typos, formatting, etc. Keep the audience in mind: make sure your talk is engaging. All talks will be in English. If your talk is selected make sure to rehearse it a few times to ensure that it lasts either 30 or 5 minutes exactly, depending on the talk format you choose. There will be no Q&A. We will reimburse your plane or train ticket to Barcelona. Up to 300 EUR within Europe, up to 900 EUR if coming from outside Europe and up to 1200 EUR from Oceania. Accommodation in a comfortable hotel close to the venue (3 nights). If you’d like to stay longer, we can help you arrange things, just let us know. You will have to cover any extra nights, though. If your employer can cover your travel and hotel expenses, we’ll be happy to list them as a diversity sponsor. The money we save will be invested in scholarships for attendees from underrepresented groups. Professional photos and video recordings of your talk during the event. Ticket to attend the conference. If your 5-minute talk proposal is selected we will offer a free ticket to attend the conference. Do you want to help us make this year’s conference the best of its kind yet? We would like to hear from you! Inspire others and be a part of this breathtaking event while making an impact on this marvellous developer community. Submit your proposals here:https://goo.gl/forms/h0iYXVpGeIQ5aj7D3 until March 24th, 2019, midnight CET. Important: We will record and publish all talks on YouTube for free under a Creative Commons license, we expect you agree on this, but if you have any concern about it, please let us know. If you’ve always wanted to attend JSCamp Barcelona, but have difficulty attending the conference this is your chance!